From Birth to Death contains the mantras, instructions, applications, and philosophy for all the rites of passage in the Hindu dharma from the Vedic wedding ceremony to the funeral rites performed at the end of life. The basic resource for this is the compilation is the Purohit Darpana, which is probably the most prestigious and practical authoritative text on Hindu ceremonies. The last half of the book is a questions and answers section compiled from the online classes that took place in 2010. Comprising 717 pages and complete with original Sanskrit mantras, Roman transliteration and English translation. There are two threads of the Book to Death book. It is a manual of spiritual techniques for life’s passages/phases that allow us to align ourselves with the heart and soul of life’s meaning. 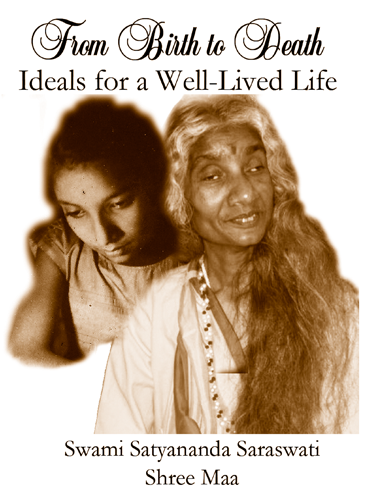 Equally, throughout the book is the message of devotion, what Shree Maa and Swamiji offer us, this continuum of devotional ecstasy that runs into and through and beyond all practices and time. What a huge collection of rites of passage! The breadth of this book truly takes the reader through initiations that include every aspect of life. I really love the question and answer section because it addresses so many issues relevant to living a meaningful and fruitful life. All I can say is WOW! Thank you Swamiji for such a concise, beautifully translated, all encompassing presentation.